Celebrate 4 years of delicious beer at Mike Hess Brewing's 4 year anniversary party, taking over Grim Avenue in North Park on Saturday, July 19! Enjoy some of Hess Brewing's favorite local breweries and eateries, including special collaboration brews and casks, as well as live music, great folks and excellent vibes. SanDiegoVille is offering $10 savings on GA tickets, as well as raffling off 2 general admission passes to the festivities. Entering our contest is easy - input your email below to enter, and we'll contact the winner no later than July 16! 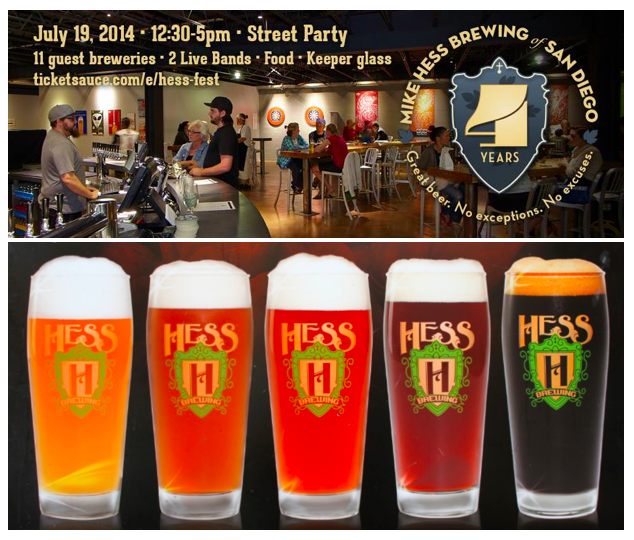 Enter for a chance to win 2 passes to Hess Brewing's 4 Year Anniversary Party! 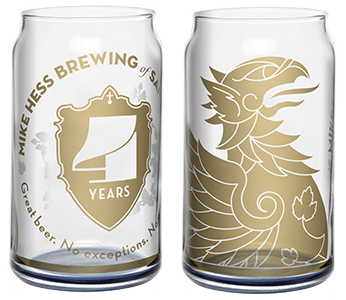 Mike Hess Brewing is pulling out all the stops to celebrate 4 years. The event will include 11 guest breweries, two live bands (The Routine & Sandollar) and great local food from Coin Op Game Room, Crazee Burger, O’Brien’s, Sicilian Pizza Thing, Carnitas' Snack Shack's Smoke House Kings, Slater's 50/50, Toronado, URBN Pizza, and Waypoint Public, all taking place on Grim Avenue between University and North Park Way. General Session tickets (12:30-5pm) are $40 and include unlimited samples of 30 different beers, a commemorative taster glass (pictured left) and food tasters (4 total) from any of the participating eateries. Full size portions of food will be available for purchase. SanDiegoVille readers can save $10 on GA tickets by entering promo code SDV upon checkout. VIP Session tickets (12-1:30 VIP area) grant you all of the above but also includes access to a private Collaboration Cask Session. Additionally, VIP ticket holders get an extra special treat - not just early entrance, but an exclusive, private party in the Hess Brewing tasting room where they will be treated to tastings of Mike Hess Brewing’s Grazias revamped 10 different ways by the collaborative efforts of guest breweries - AleSmith, Coronado, Green Flash, Karl Strauss, Mission, Monkey Paw, Mother Earth and Stone Brewing. In addition, Andrea’s Truffles will have some special treats for VIP ticket holders during the tasting. Tickets are available online at ticketsauce.com/e/hess-fest/534e0fac-792c-4895-8937-42e54834d839/tickets. Don't miss this amazing beer fest and a chance to sample one-of-a-kind brews! Mike Hess Brewing Tasting Room is located at 3812 Grim Avenue in North Park. For more information on the anniversary party, visit mikehessbrewing.com/Events.